Parents who have toddlers always have this uneasy feeling that their little bundles of cuteness are actually smarter than they think. I like to think they have their own set of superpowers which make them capable of feats that either amaze or exasperate you. 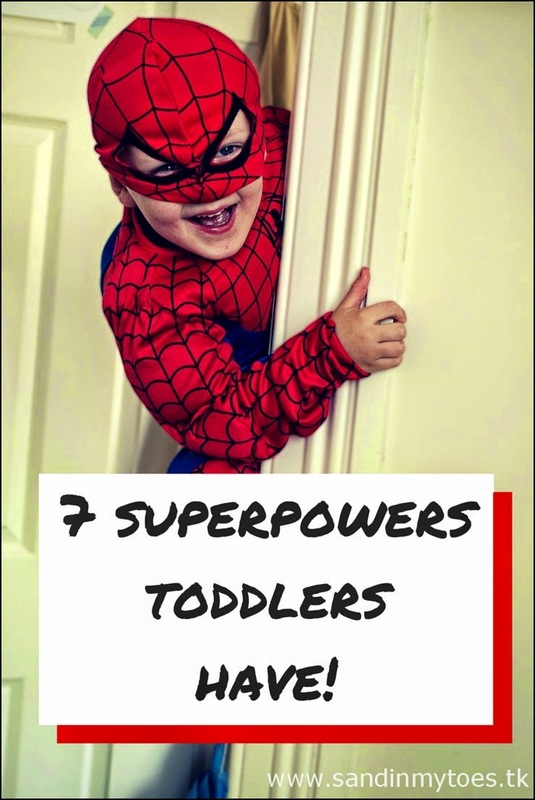 These are seven superpowers that toddlers seem to have! How do toddlers always know when there's candy in the house? It's like they can sense it's presence no matter where you hide it. This superpower is especially powerful when you have your eye on the candy, and if you make the mistake of eating it while they're still awake, you will be caught! I'm sure all moms have experienced this - the minute you put your feet up to take a little break, they will demand your attention with the utmost urgency. Somehow, they always know when you need a little bit of quiet and make sure it's anything but quiet that you get! Remember that toy you thought he didn't play with anymore? Or the ragged stuffed toy she liked but seems to have forgotten? Well, the minute you toss it away, they will miraculously remember everything from the moment of birth and ask for it! This also holds true for unfinished candy bars which you 'tossed' in your mouth. Those, they will remember at two in the morning. Okay, there has to be some secret source where toddlers get their energy from. I'd like some of that at the end of the day. It's amazing how long they can last with only a half-hour nap. They probably have some kind of reactor inside which generates all that unlimited energy! They don't have the Invisibility Cloak, but they sure know what to make themselves invisible from your eyes. Toddlers fit into the smallest and strangest places, so it's really a losing battle when you can't find them, especially at bedtime. If you've taken your toddler shopping, you what I mean. Those little feet are capable of super speed and good luck to you if you want to keep an eye on them. They disappear in the blink of an eye, and think it's funny when you have a near heart-attack watching them leaning over a fountain. Don't be disheartened though, moms get back with their own superpowers to keep these tornadoes of energy in check! Hit the nail right on the hand. I always get hit by the relaxing sense. Ha! Thank goodness I don't have toddlers anymore!! my 6 year old had a crying fit over a toy vacuum we got rid of two years ago (broken) They have incredible memories! This list did make me laugh...then I became worried. Why? They somehow manage to keep hold of these superpowers even when they're no longer toddlers!! That's a good way of putting it! Yes, I know that one too! Glad you liked it, Lucas! Oh well, I need to buckle up then! OMG yes! All of them as so right on! Yes! I especially love Invisibility because YES!!! Ha! It's been a while since I have a toddler, but all of these sound pretty familiar! Yes! You totally nailed it. Especially the "mom relaxing" one. Ha!